Water stratification occurs when water masses with different properties - salinity (halocline), oxygenation (chemocline), density (pycnocline), temperature (thermocline) - form layers that act as barriers to water mixing which could lead to anoxia or euxinia. These layers are normally arranged according to density, with the least dense water masses sitting above the more dense layers. Water stratification also creates barriers to nutrient mixing between layers. This can affect the primary production in an area by limiting photosynthetic processes. When nutrients from the benthos cannot travel up into the photic zone, phytoplankton may be limited by nutrient availability. Lower primary production also leads to lower net productivity in waters. 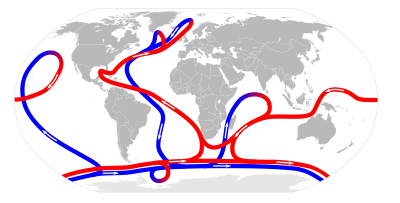 A large-scale circulation of horizontally stratified water masses, called the thermohaline circulation, occurs in the ocean. The entire circulation pattern takes about 2000 years. Stratification may be upset by turbulence. This creates mixed layers of water. Forms of turbulence may include wind-sea surface friction, upwelling and downwelling. Marshall et Al. (2002) suggest that baroclinic eddies (baroclinity) may be an important factor in maintaining stratification. ↑ Miller, Charles B. (2004). Biological Oceanography. Blackwell Publishing. ↑ Iriarte, J.L. ; Gonzalez, Liu; Rivas, Valenzuela (2007). "Spatial and temporal variability of chlorophyll and primary productivity in surface waters of southern Chile (41.5E, 43S)". Estuarine, Coastal and Shelf Science. 74 (3): 471–480. doi:10.1016/j.ecss.2007.05.015.